It's paid work, so I'm guessing the guests would choose work over football? Besides the event will be over by then (and judging by this awesome line up, I don't think the fact it's the final has put anyone off!!) you never know, if and I stress 'if' England did get through to the final, imagine the buzz on the Sunday!! I personally will be nursing a hangover from my birthday shindig on Saturday, so will be under a duvet all day and night probably !! Here is mine, hoping to add the avengers A on there at some point, along with firefly!! They used to have an early bird family ticket, not children ones (as far as my memory serves me) we used to get them and bring two of our children but since they do not have this option, we cannot not afford this anymore, we were all set not to come but since the BSG guests were announced, we decided to attend on the Friday, just meself and husband, £12 that's all it cost instead of £60 it would have cost us before we even did anything, we still even might take the kids (it's my birthday on the Saturday and wanted adult comic con time) it used to cost half of that. Bring it back please!! What do people do in the evenings? We put a thread up on here when we stayed three years ago, we had a group of about fifteen of us descended on the hotel bar and we had a blast, loads of people that didn't know each other, all having a laugh and a drink (or several ahem!). Brilliant!! Why arnt we going this year?!!! I have booked my photoshoot with him on the Friday!!! 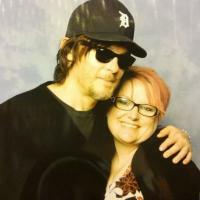 I am very excited by this, even more excited than I was when I met Norman Reedus!! Oh my god!!! We wasn't going but we are now!!! It's my birthday on the Saturday!!! Thank you!! !